April could see over 50,000 people moving home. However, although this can be an exciting time, the disruption and anxiety caused by a home move can also cause stress to our pets. Dogs in particular like consistency and a home move can create behavioural problems. 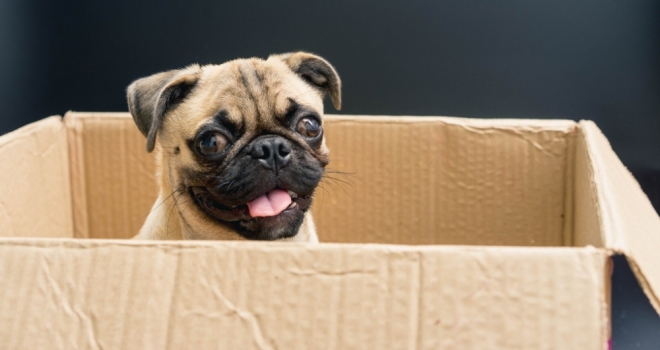 As it's National Pet Month, home moving and insurance tech firm, buzzmove, offers it's Top Tips help movers and their pets cope with a change of location. Animals pick up on stress. Rushing the packing in the last few days before moving home can cause pets huge amounts of anxiety. If they have time to get used to the shifting of boxes and furniture and belongings being moved about, the big day won’t seem so unusual so they won’t panic unnecessarily. Moving boxes can easily get muddled, left in the wrong place and impossible to track down in a hurry. Have a clearly labelled box specifically for your pet-related items and keep it close by. Food, bowls, toys will all help your pet feel more at ease in the new setting. Tripping over the cat in the kitchen or the dog in the doorway will do nothing to reduce the stress of moving day. If at all possible leave your pets with someone they know well for the day of the move. To help downplay the move, keep feeding, walking and grooming times the same and position the pet’s bed in a similar location in the new home. This should help them to adjust more quickly. Ensure the details on your pet’s microchip records are updated from the day of the move – don’t leave it until after you’ve settled in and unpacked. Also, make sure you get a new tag for your dog or cat’s collar to avoid any Good Samaritan taking them to your previous home.